Gracing fireplace mantles and shelves for more than two hundred and fifty years, antique mantle clocks range in design from highly ornate to stylishly sleek. Made small enough to set on a fireplace mantle or shelf, these clocks are key wound and run from thirty hours to eight days, depending on the specific clock. Also known as shelf clocks, the clock's movement was made of brass or wood. Similar to many antique wall clocks, they have a swinging pendulum. However, the positioning of the clock movement is different from that of a wall clock. The movement of a wall clock is set in an upward position on the clock's backboard; however, the movement in a mantle clock is made to lie horizontally on the clock's base, also called the seat board. Originating in France in the mid eighteenth century, the early French clocks for mantles were typically very ornate and highly decorative to match the furniture styles of the day. Many were decorated with small angels, cherubs and other angelic type figures. This style of clocks is sometimes called a cherub clock. These early French clocks were made of a combination of materials including gilt metal, wood and porcelain. The most popular gilt metal of the time, ormolu, was made of ninety-three percent bronze and seven percent gold. By the end of the eighteenth century, the popularity of the mantle clock had spread quickly throughout Europe and was reaching the wealthier homes in the United States. In the early part of the nineteenth century, Connecticut clockmaker Eli Terry, along with Silas Hoadley and Seth Thomas, began mass producing clocks which made them more affordable to own.The most significant change from hand-crafted clocks to clocks mass produced in a factory was the movement. Instead of using expensive brass for the clock movements, the movements were made from wood. By 1830 the idea of wooden clock movements was so popular there were hundreds of companies, in Connecticut alone, making clocks with wooden movements. Although some styles of American mantle clocks incorporated brass or iron in their design, the clocks were generally made of porcelain, oak or cherry wood. 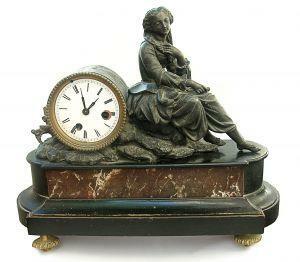 The clock bases were decorated in many different ways some using solid wood panels, often engraved or carved, with others including painted scenes and sculptures. Introduced in the 1840s, the Ogee Clock featured a curve in its molding that is shaped like an ''S''. This design became very popular and a number of variations developed. Resembling a church steeple, the steeple clock was designed by Elias Ingraham in the mid eighteen century. The steeple clock has column-like sides and a triangle shape front, resembling the steeple of a church. Two of the many variations of the steeple clock are the beehive and the double steeple clock. Art Deco mantle clocks feature exquisite art deco designs and figures. Many are gorgeous combinations of materials such as silver, onyx and gilded metal and have removable garnitures. One of the most popular clocks of the eighteenth and nineteenth centuries, antique mantle clocks are highly desired by collectors.